The cycle of life is central to the Navajo - from the individual to the ancestors to the cosmos - and they believe that all living things - people, plants, animals - are their relatives. Shonto Begay's mother was a traditional rug weaver and his father a respected medicine man. He heard his grandmother's stories and those of other elders. Days spent along herding sheep gave him time to reflect, and dream, and develop his own vision of the creation with which he is so intimately engaged. Composing My World depicts "playtime during shepherding there on the sandstone outcroppings of Shaan toh'." It wasn't unusual for Dine (Navajo) boys to have toy figurines to dig out for those rare moments of play and moments of making their own stories. 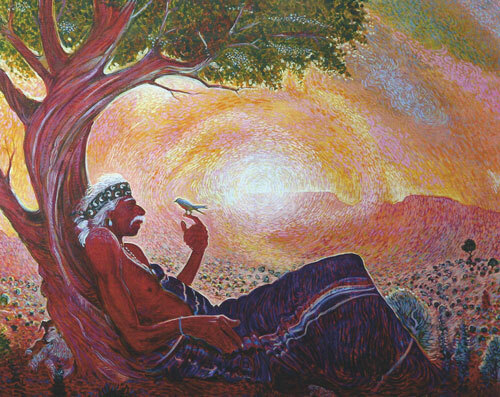 Shonto Begay, Composing My World, acrylic on canvas, 24"x48"
The cycle of life takes tangible form in his painting Grandfather's Late Light in which the figure picks up the curve of the ancient tree and the energetic brush strokes of light complete the circle. Shunning "beautiful superficiality," Begay says, "it's the pulsing of the land I try to capture." 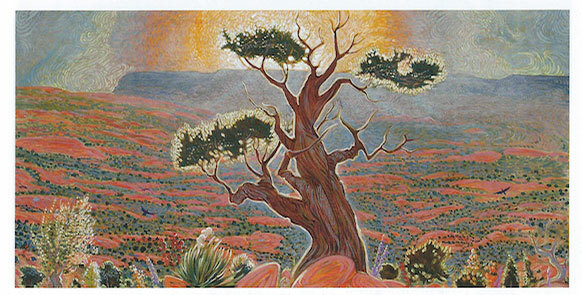 Shonto Begay, Grandfather's Late Light, acrylic on canvas, 48"x60"
Ancient trees as symbols occur often in his work. Black Mesa Sunrise is the "view from my home looking east. A vision of another flesh beginning offering prayers. My grandfather tree, a sentinel tree over my birthplace." Dr. Mark Sublette, president/CEO of Mark Sublette Medicine Man Gallery, says, "The best words to describeShonto Begay are 'original voice.' To me, he screams uniqueness, the epitome of what I look for in an artist." Begay's feeling of oneness with the land and its energy and nearly all other aspects of his ancient heritage were nearly wiped out by his experience of having to attend Bureau of Indian Affairs boarding schools, which he called "just a step below a concentration camp." Shonto Begay, Black Mesa Sunrise, acrylic on canvas, 24"x48"
Today, however, he works to keep Dine traditions alive and paints, speaks, and writes about the encroaching development on the environment of his ancestors. In the midst of their frenzied lives, Begay urges people to stop and to celebrate the cycle of life. "Pause in the day to gaze up into the peaks, and cast your spirit aloft there where prayers return as droplets of water."